Composers Levy Lorenzo and Peter Evans began performing duo as part of the International Contemporary Ensemble’s OpenICE commissioning series in early 2016. 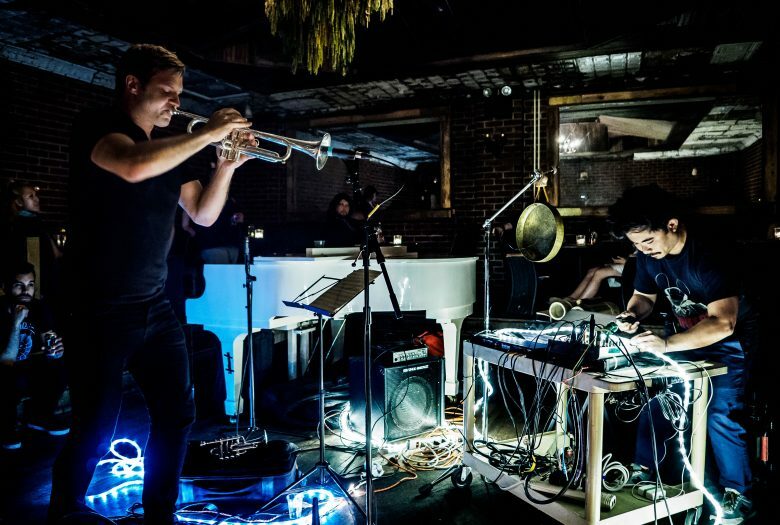 Their music is an otherworldly blur of dense rhythmic frameworks, elaborate notated pieces, open improvisation, and weird drones. Lorenzo’s complex of self-built instruments, gongs, dry percussion, laptop, and sound processing engage with Evans’s acoustic trumpet in a dialogue of noise, mystery, precision, and chaos. Filipino-American Levy Marcel Ingles Lorenzo, Jr. works at the intersection of music, art, and technology. On an international scale, his body of work spans custom electronics design, sound engineering, instrument building, installation art, free improvisation, and classical percussion. With a primary focus on inventing new instruments, he prototypes, composes, and performs new electronic music. As an electronic art consultant, Levy designs interactive electronics ranging from small sculptures to large-scale public art installations with artists such as Alvin Lucier, Christine Sun Kim, Ligorano-Reese, and Leo Villareal. As a percussionist, he co-founded the experimental theater/electronics duo Radical 2 with Dennis Sullivan and is a member of the Peter Evans Septet. As a sound engineer, he specializes in the realization and performance of complete electro-acoustic concerts with non-traditional configurations. One of his main engagements is Claire Chase’s Density 2036 project. A core member of the acclaimed International Contemporary Ensemble (ICE), he fulfills multiple roles as live sound engineer, electronicist, and percussionist. Filling a unique niche, Levy is in demand as a freelance designer and artist. His work has been featured at STEIM, Harvestworks, MIT Media Lab, Ensemble Moderne, Darmstadt, Yellow Barn, Pitchfork.com, Slashdot.org, G4TV, Grey Group, Bose, The New York Times, BBC, and Burning Man. An advocate for interdisciplinary arts, he has collaborated with dancers, video artists, public artists, mathematicians, sculptors, architects, and dramaturgs. Bridging the gap between the electronics design cycle and the performance practice of cutting-edge contemporary music, Levy is as equally comfortable wielding a soldering iron as drumsticks and four-mallets. He has fluency navigating hardware schematics and coding in various software environments, as well as interpreting complex musical scores and playing chamber music. Levy earned degrees as Master of Electrical & Computer Engineering from Cornell University, and Doctor of Musical Arts in Percussion Performance from Stony Brook University. He has given numerous guest workshops and lectures on electronic musical instrument design and teaches at CUNY Hunter College as well as CUNY College of Technology. He recently received commissions from the American Composers Forum and Pringles. Peter Evans is a trumpet player, and improvisor/composer based in New York City since 2003. Evans is part of a broad, hybridized scene of musical experimentation and his work cuts across a wide range of modern musical practices and traditions. Peter is committed to the simultaneously self-determining and collaborative nature of musical improvisation as a compositional tool, and works with an ever-expanding group of musicians and composers in the creation of new music. His primary groups as a leader are the Peter Evans Ensemble and Being & Becoming (with Joel Ross, Nick Jozwiak and Savannah Harris). In addition, Evans has been performing and recording solo trumpet music since 2002 and is widely recognized as a leading voice in the field, having released several recordings over the past decade. He is a member of the cooperative groups Pulverize the Sound (with Mike Pride and Tim Dahl) and Rocket Science (with Evan Parker, Craig Taborn and Sam Pluta) and is constantly experimenting and forming new configurations like-minded players. As a composer, he has been commissioned by the International Contemporary Ensemble (ICE), Yarn/Wire, the Donaueschingen Musiktage Festival, the San Fransisco Contemporary Music Players, the Jerome Foundation’s Emerging Artist Program, and the Doris Duke Foundation. Evans has presented and/or performed his works at major festivals worldwide and tours his own groups extensively. He has worked with some of the leading figures in new music: John Zorn, Kassa Overall, Jim Black, Weasel Walter, Matana Roberts, Tyshawn Sorey, Levy Lorenzo, Nate Wooley, Steve Schick, Mary Halvorson, Joe McPhee and performs with both ICE and the Wet Ink Ensemble. He has been releasing recordings on his own label, More is More, since 2011, with 5 new releases in 2018.